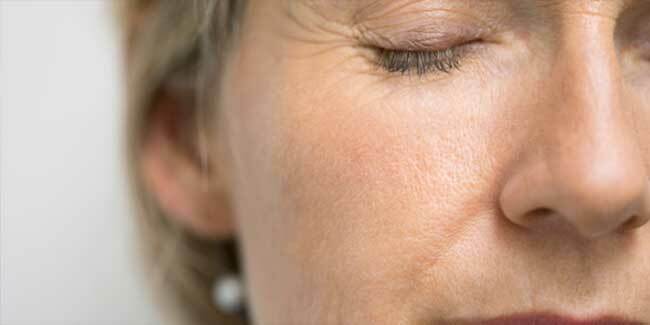 Frequent facial movements, sleeping postures and sun damage contribute to the formation of wrinkles. Due to the ageing process, the skin loses its plumpness and elasticity as production of collagen. People who have naturally dry skin are prone to premature ageing and wrinkles. Did you know frequent facial movements, sleeping postures and sun damage all contribute to the formation of wrinkles? Let's get to the basics of it. As we age, our skin tends to get drier and less elastic due to loss of collagen and elastin which are skin proteins which aid in plumpness and elasticity. Frequent facial movements, sleeping postures and sun damage all contribute to the formation of wrinkles. Wrinkles are characterised by fine lines, deep creases or furrows on the skin as we age and are mostly found in areas which involve frequent movement such as the area around eyes, mouth and neck. Due to the ageing process, the skin loses its plumpness and elasticity as production of collagen and elastin decreases. The skin tends to get thinner, drier and is prone to sagging, allowing skin to develop fine lines or deep creases overtime. Exposure to ultraviolet rays of the sun accelerates the process of ageing. Radiation from the sun damages the skin tissues i.e. collagen and elastin, their regenerative process gets affected and skin loses its flexibility. Skin becomes prone to damage and premature wrinkles are formed. The production of collagen is decreased in the skin due to smoking, resulting in premature ageing. Frequent facial movements, expressions and sleeping postures are also causes of formation of fine lines and wrinkles. The skin creases while we sleep or when we emote with our face. Also as we age, skin starts losing its elasticity making these creases permanent. Fine lines or deep creases thus, form. People who have naturally dry skin are prone to premature ageing and wrinkles. Frequent moisturising can help prevent fine lines from forming. Smokers are at a risk of ageing prematurely as smoking is known to hamper the production of skin’s connective tissues. People who are exposed to the sun's rays for a long duration can suffer from skin damage, giving rise to formation of wrinkles. Topical medicines and creams such as retinoids which are derived from vitamin A help in reducing wrinkles and treating ageing skin problems. Topical creams which contain tretinoin are also a retinoid. Usage of these topical medications might cause inflammation and dryness. Over-the-counter wrinkle creams containing ingredients such as retinol, alpha hydroxyl acids (“fruit acids”) and antioxidants can be used, though the result is very subtle and mild improvement in wrinkles are seen. Chemical peels involves the use of one of the different kinds of chemicals that burn away the top layer of the skin, creating enough damage that the skin repairs it by making more collagen. After a few sessions of chemical peels, you will find yourself younger-looking and with a smoother skin. Dermabrasion entails use of a vacuum device in tandem with a mild form of chemical crystal that help remove the top most layer of the skin's cells and enable the formatio of new, evenly textured skin to the surface. Laser resurfacing uses energy as a source of light in the form of a laser or pulse diode light to remove the top layer of the skin, leading to a slight wounding of skin, which enhances the production of collagen to give rise to a wrinkle-free and smoother skin. Wrinklef fillers enable doctors to fill the wrinkles with different substances like collagen, hyaluronic acid and some other synthetic compounds. Botox is a medical procedure by which an injection of a purified version o Botulinum toxin A helps to relax the muscles that lie below the wrinkle, thereby letting the upper layer of skin to be crease-free and therefore, smooth.